Clean, comfortable lodging to explore western Nova Scotia. We had a nice five night stay at Fundy View in mid-October. The house was clean and comfortable - we only occupied the ground floor, but the upper floor looked just as good. As a cyclist, I appreciated the nice and quiet shore road, and the access to much more demanding climbs of the north mountain than I had imagined before we got here. We had our Border Collie with us, and good place for a pet, albeit a little close to the road. The owner's manual of places to visit was also much appreciated. Everything was pretty much as advertised, and we were entirely happy with the stay. Two comments for improvement however. The lack of internet access and TV was mentioned in the VRBO listing, but certainly did hinder our stay, particularly since cell phone signal was also almost non-existent. We did not miss the TV, but while we are not huge internet surfers, our main method of staying in touch with family or house sitters back home is through email or text. While we appreciate the comment that the purpose of staying in such a lovely setting is to get away from electronic devices, modern lifestyles do require at least minimal access. Secondly, the reminders throughout the house of the need to not run the well dry were perhaps a little overdone. We are rural dwellers, so appreciate the need to be careful with timing of well usage. We also understand that urban people may not have this awareness. However we found ourselves wondering whether even moderate use would run the well dry. In the end, we had no problems, and eventually got more comfortable with showering, dishwashing and doing laundry. Perhaps a little more detail on what specifically would cause problems (and what is no problem) would be useful. All in all a good stay, and a nice property. Hi: Thanks so much for taking time out to write such a nice review..including suggestions. Problem re internet is that there basically is none of any use on the shore, which is a constant problem for those of us who live there. Supposedly NS govt is going to invest some funds to improve it thru out the area, but we've been told that before. Our little library in town has somewhat high speed for free and is a nice place to visit. We tried supplying internet and everyone was so unhappy and gave us such lousy reviews that we have just given up. Frustration reigns with us also. (We did install a land line so that people could stay in touch in case of emergencies but we should probably put in more info re that before you arrive??) One our favorite comments was one family that listened to baseball games on the radio while their kids played board games. Best we can do. I'm from the states and it drives me crazy also. sorry. Re the water situation. We hear you and will try to make the situation clearer. HOWEVER, the problem is that so many city dwellers do their laundry, run the dishwasher, and take showers at the same time in both bathrooms...this has happened to us over and over again and cause a plumber visit at $100 per pop. So we admit we have laid on stern warnings. We will try to figure out a way to make the city folk understand ...it is not a problem if all the mentioned water uses are not done at one time and we have tons of water...so sorry it caused you some trepidation. Believe it or not our worst offender, six plumber visits in six days, was a couple from the backwoods in Virginia, who had their own well! Wish you had telephone Gladys to clarify so you wouldn't have had such initial anxiety. We will try to describe the situation better. Glad you liked the old place, when I'm 150 years old I don't expect I'll be in very good shape. We are back from our Europe and cruise and so sorry we didn't get to meet you. Loved that it was out of the city. Not far from the coast. Could see the water from the front porch. Spent 3 days there. Two were sunny and beautiful, the third day it rained all day so we just hung around read and played games. Not to far from some beautiful areas. Expected an old farmhouse and got one. The biggest problem for us was the horrible smell as you walked in. Great location. Lots of good articles/literature on the area. House was clean lots of space for 4. So sorry you didn't call us as requested. if there was a problem. We hadn't opened the windows as there was threat of rain. If it persisted and was a bother after the windows were open , we have another cottage on the river we could have moved you to. So sorry for your disappointment and that you didn't contact us. Hope the rest of your trip has been wonderful. 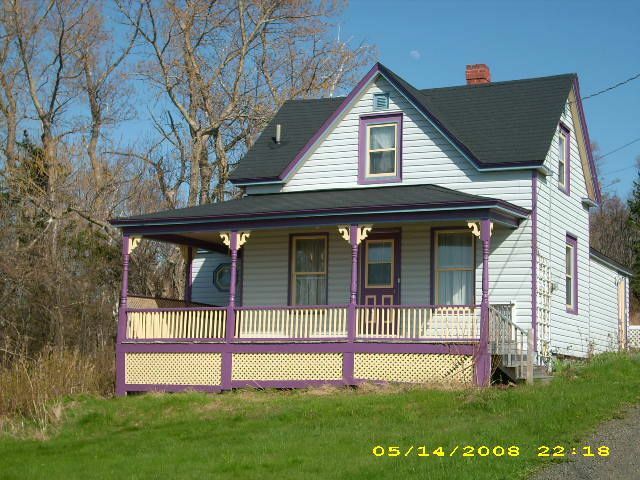 This is a great character home with a beautiful view of the Bay of Fundy. Our family, which included my parents, who are in their seventies, my brother, his wife and two daughters 11 and 14 and my bf and I stayed at the Farm House for 3 busy days this summer. This is a very well maintained 150 year old home that is fully equipped. We loved the quiet location that is a short drive from the seafood market, Annapolis Royal and many other beautiful areas in the valley. The owners have tons of information on things to do in the area to keep anyone busy. Most of the things we did in the area were based on their recommendations and did not disappoint. Thank you for sharing this piece of history with our family. We loved the location and Ruth and Gladys had so many great tips on things to see and do! We enjoyed our stay very much! I$129 Rate quoted is for two persons Additonal persons are $25 per night per person. Two night minimum stay. No charge for children under eight. (NOTE: VRBO will not give you the correct rate if you have children. Make direct contact with owner.) WEEKLY rentals require a $200 damage deposit, paid at checkin and refunded at checkout. Pet deposit is $50. Guest is responsible for pick up after pet. Pet deposit will be returned at checkout if pick up policy is complied with. Thank you Cancellation and refunds. Cancellation within two weeks is 100% refund. cancellation within up to one week is 75%. Less than one week is non- refundable.